Every single thing about your garage doors will have a huge impact to your home’s exterior and personal comfort. Factors, ranging from the materials to the opener, will reflect your style and affect the security of your home. Selecting a new garage door is a serious task and surely a difficult decision. To help you out, we have created a list of factors that will (or should) most likely influence your decision and also a list of things you must take into account when choosing residential garage doors. Here we go. There is no doubt that with the new garage door installation, you make an effort to improve the looks of your home exterior. The question is whether you are looking for a garage door that will meet your personal needs or want it to increase the home value since you are planning to sell the house in a few years! To put your mind at ease, any new garage door will make a difference to the return of value. Even if you don’t have kids, the electric garage door must run safely and safeguard your property. Have no doubt that whichever opener you choose today, there will be security and safety features. And you can choose garage door openers with enhanced features. Just remember that safety and security problems are avoided when both the garage door and opener are properly installed and fixed. You are bound to stick to your family budget. Who doesn’t? The good news is that the garage door prices might be high or low and so you can find a product within budget. If you don’t have much money to spare, prefer to give up luxuries and rather get durable materials and parts. Today, there are composite wood garage doors that make maintenance easy. It’s important to consider how much time you can devote to clean the overhead door and how often you are planning to call a garage door company for a maintenance service. This will help you choose among high and low maintenance materials. Consider wood doors high-maintenance products where composites, steel and glass doors are low-maintenance. Though, you need to remember that you won’t only be called to fix dents on your aluminum garage door or repaint and wash the door. 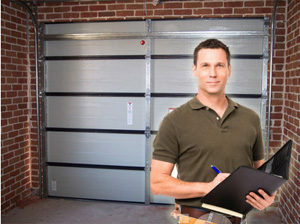 A typical garage door maintenance service mainly includes inspecting and fixing the parts since keeping the mechanism running is the most important thing. So you won’t really avoid routine services. If you were planning to get a composite door just to avoid maintenance, the only advantage will be that you won’t have problems with the door itself – the material if you will. But you’ll still need to have the parts checked. Now, here’s a list of things to take into account when choosing garage doors. The easy way to do this is to think all the above considerations since they will guide you in choosing correctly. If this is a garage door replacement, your options are most likely limited to the type you already have. If this is a fresh door to a new garage, you need to measure accurately to decide whether a rollup, one-piece, or sectional garage door will match best. This has entirely to do with your style and the architecture of your home. 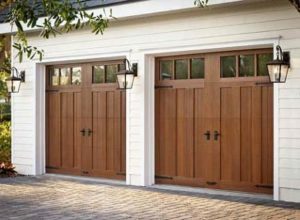 A carriage house garage door is rather traditional while more minimalistic styles, like flush designs, fit better in modern homes. There are actually many options but you should start by defining your home exterior design. If this is a fresh garage door installation and you have decided on the type you want, you should also consider the size. Keep in mind that there are one- and two-car standard garage door sizes but the options are limited. If you prefer an oversized door, you will need to have it custom made. The good news is that this is possible. While the above factors will put you in the right track when trying to select garage doors, keep in mind that there are many more factors to consider, ranging from a possible insulation, wind load possibilities, tamper-resistant parts etc. So it’s always best to talk to a garage door contractor before you make up your mind.